Downs begins his third season with the Ducks and 17th in professional baseball. The southpaw spent three seasons in the Major Leagues, including two with the Detroit Tigers (2012-13) and one with the Houston Astros (2014). He combined to make 92 relief appearances, posting a 4-4 record with a 4.76 ERA and 84 strikeouts over 90.2 innings of work. The Florida resident tossed a scoreless inning in his MLB debut on July 3, 2012, against the Minnesota Twins and made four consecutive scoreless appearances to begin his Major League career (5.1 innings). The 34-year-old combined to make 29 starts during the 2015 and 2016 seasons as a member of the Ducks. He accrued a 12-10 record with a 3.70 ERA, one complete game and 163 strikeouts over 172.2 innings of work. He also pitched eight scoreless innings over two playoff appearances (one start) in 2015. The Michigan native’s contract was purchased by the Uni-President Lions of the Chinese Professional Baseball League in July of 2016. 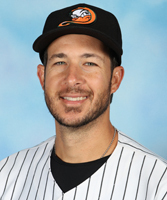 He spent parts of three seasons in the CPBL before joining Sultanes de Monterrey in the Mexican League during the second half of 2018, turning in a 3.42 ERA, one save and 28 strikeouts in 12 games (five starts). Downs was originally selected by the Chicago Cubs in the fifth round of the 2003 amateur draft.